In the Eyes of the Living. When a friend forwarded Outreach Worker at IBC a few months ago, I thought: An important project, though maybe too miserable for me to take on? Then I wondered: Why do we need to honour the dead? Spiritual and religious reasons aside, I don’t believe the dead need honouring, commemorating or even remembering. The living do, as we search for a way to honour our memory of a loved one who is no longer with us in body. When their life ends, I would want to find a sense of completion, and possibly peace, to continue living mine as best I could. Though in the context of violent conflict, as the case is with Iraq and sadly much of the Middle East now, how can I find peace when so many are losing their lives at an astonishing rate? I came across Iraq Body Count website (IBC) when it was first set-up in 2003, by volunteers in the UK. I remember logging on to their database, with a daily recording of lives lost to violence, and saw named incidents, and mostly, numbers of recorded dead. In 2003, I was too emotional with the war, and inwardly conflicted, as my adopted county of citizenship, the United Kingdom, lead a war on my country of origin, Iraq. I couldn’t relate to the lists of the dead, and didn’t want to. It was too painful a reality to face. Revisiting the site, in preparation for the job post, the only question that kept coming up for me, as I saw entries like ’17 dead in Mosul, suicide bombing’, was ‘and then what..?’. How can I relate to this information? Who is the person behind the death? To explore the living survivors of lives lost. Applying for the post, I decided that, if offered the job, I’d only take it if I was able to explore the living survivors of lives lost; the psychotherapeutic resilience entailed in carrying on with the business of life, when my son or best friend are killed suddenly and senselessly. 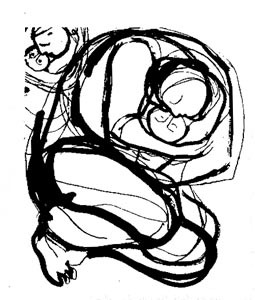 Having taken the job of Outreach Worker for IBC, I am now asking: are Iraqis, inside and outside Iraq, starting at home with UK Iraqi diaspora, ready to begin to face the pain of those lost to violence? If yes, how do we want to do this? How can we, as war continues today? By Iraqi artist, Jawad Saleem (1919- 1961). 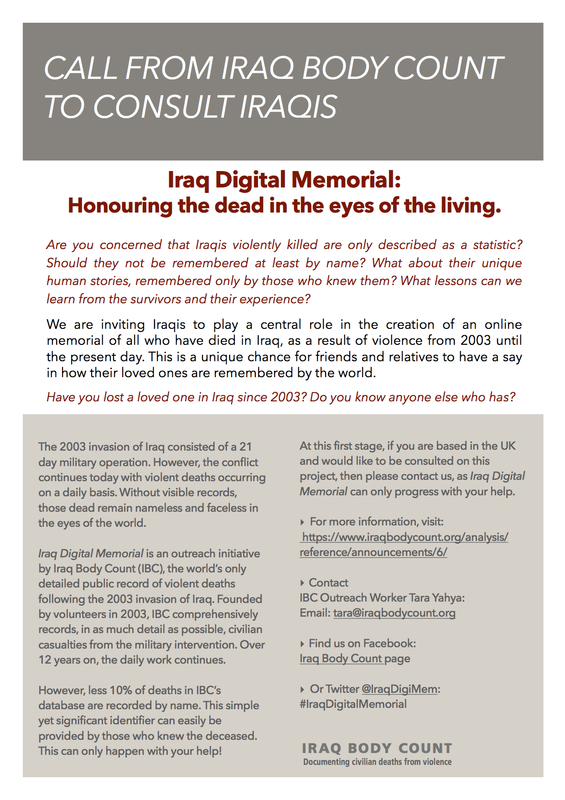 Iraq Digital Memorial is a potential future, online record of the dead, as remembered by those living who knew them. It’s a simple concept: if I have lost a friend or relative in 2003-onwards, I log on, get authenticated, and share what I knew about this person. This sharing would be in two parts: factual demographic information, like their name, age, profession. Then the second part, is to include short stories, personal narratives, of the deceased; what do I remember of them? What were they like? What reminds me of them today? The second, personal part is what I’m more familiar with, though the importance and relevance of the latter (IBC’s bread and butter!) only hit me when I was chatting to family a few weeks ago, namely, my stepmother. She related how, in 2003, she and my father escaped the imminent 2003 war, to stay with my brother in the UAE. And how, her mother, in Baghdad, took it upon herself to check on their pet cat, Simsim, and golden labrador, Lucky. Her mother, without much thought, drove towards my parents’ home, and upon exiting an underground tunnel, found herself face-to-face with a US tank. British Prime minister Chamberlain made on the eve of the World War II in September 1939. The more privileged, like my parents, knew and made decisions accordingly, for example, some with children or elderly chose to stay put in the hope the war would be short lived. Witnesses spoke of US army tanks, on Baghdadi streets in March 2003, shooting all who roamed the streets, meant that many civilians killed had truly been innocents going about their daily routine, suddenly struck dead. My step-grandmother (is that a term?) wasn’t shot, possibly (my stepmother believes) because she was driving my father’s olive green, American jeep. She tore her white underskirt, and came out waving it as a flag of surrender towards the soldiers. She was promptly sent home, shaken though otherwise alive and well. My stepmother cried as she recalled her brother, who lost two of his best friends to US military tank firings that same week, angrily accused her of risking their mother’s life: ‘she would have died because of your stupid animals!’. ‘The truth is’, my stepmom said, as she wiped her nose, in a busy London cafe, ‘she wouldn’t have died because of our pets, but because she’d have been shot by a military tank!’. This, to me, is why the factual side of casualty recording is so imperative: my death is recorded with the hard truth of who I am and how I died, regardless of how others make sense of my death, how I am remembered by those who knew me and what follows after my death. The combination of such facts, juxtaposed by the personal narratives, the oral history otherwise forgotten, is what makes this initiative so unique and potentially powerful. Another British-Iraqi participant, when asked if we are ready to begin commemorating our dead, said: We are not ready, we will never be ready, but this is important to do now, before we choose to forget or obscure the truth beyond recognition. The ‘digital’ aspect means that unlike physical memorials, it is as alive and flexible as the living, and can potentially act as a pausing reminder of those who are lost to a rapid, ceaseless conflict. Particularly as the information, both factual and personal, would be directly uploaded by those who personally knew the dead, this could also be a reflective and healing process in itself. What and how I choose to share publicly, with the world as my witness, can help find this sense of completion in myself. At a talk on ‘The Cycle of Violence’ by peace activist, Scilla Elsworthy, she spoke of how anger and vengeance only breeds more anger and vengeance, and how we need to step back and begin a process of reconciliation, which comes in many forms. I rarely pluck up the courage to speak in public events, though I found myself asking, if we can begin to heal from the traumas of violence when war was ongoing, as the case is with Iraq. She didn’t flinch, and sincerely replied: ‘yes, you lay the ground and sow the seeds, to begin a longer term healing process’. I hold onto this statement with Iraq in mind. We need to begin sowing the seeds of a peace my generation is unlikely to see, though I truly believe will come in time. Call to Action: Arabic translation to follow!